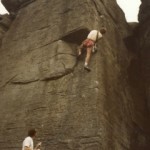 For those that are keen to improve their climbing grade, Clwyd MC offers climbing coaching. Normally we have at least one coaching weekend in the year when experienced members offer their services. This year we also had coaches from Plas y Brenin. The club also offers one-to-one coaching. Several experienced members have kindly offered their services in that regard and can be accessed through contacting Mike Doyle. It should be noted that this is an informal arrangement between members.